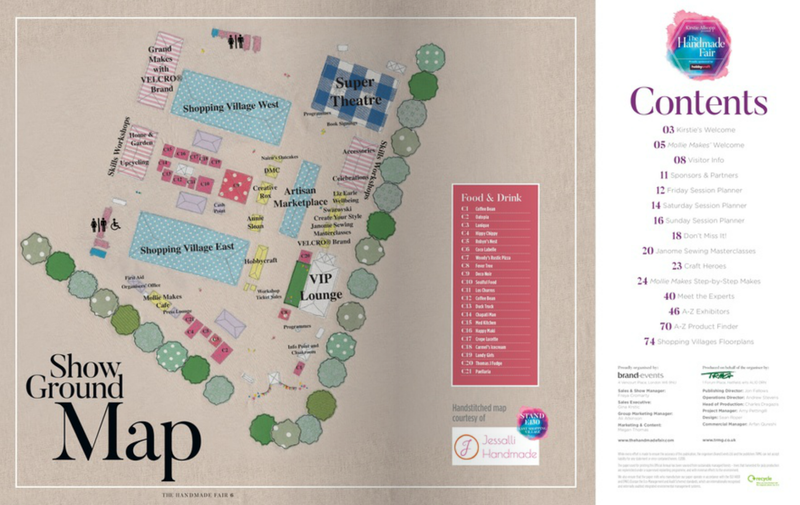 If you came to The Handmade Fair this year, you would have seen my stitched show ground map in the show guide and dotted around the fair. It was a huge thing for me to have one of my pieces as such an important part of the fair. I thought it would be fun to show you the process of how I made the map, so here goes! Firstly I did a rough sketched idea of how it would look. I then got the base technical map from the events company and started tracing each part. I used a landscaping design book to decide on a tree shape, and as we're moving house (and in temporary accommodation whilst it goes through) the map was so large, I did most of it on the floor! So much goes on behind the scenes and the events team were working flat out in the run up. As with any show, there are changes right up to the last second, so I couldn't actually finish the map until a few days before the show. So I started on all the main structures that wouldn't changed and worked from there. Each shape was cut to scale and I colour coded the tents to make it easier to navigate. I used the traced map as a guide to make sure every stand was in the correct space. And ironed them on in place. Next was all the sewing. Once each piece was secured in place, I could sew them on with my free hand machine embroidery (the fun part). I added details to the entrance, added flowers around the map and tried to make the show look just as good as it does in real life. And here it is in print! I also made cute postcards for people to take to remember this years fair- I do have a few left if you want some, let me know! I really hope you enjoyed seeing a little 'making process' it did take a while to do, but I'm really proud of what I made. Its new home is with the show manager of the fair! I was so happy she loved it!